The Dwarf Gourami originates in the waters of India and is not only beautiful but they can be particularly hardy as well. The male is more colorful while the females are less colorful. Usually the female is gray in appearance. There are a couple of color varieties including the Blue and the Flame Red. They make a great addition to a fully cycled community tank and are easy to care for in general. Some hobbyists find that these gouramis tend to be a bit too aggressive with conspecifics and choose to keep one to a tank. They should accept most fish food including flakes, freeze-dried, frozen and live foods. If you notice the coloration on your gouramis starting to fade, try supplementing their diet with freeze dried blood worms or live foods once in a while. They are not picky eaters. Care Level : Easy, good for freshwater beginners with a tank that has completed the aquarium nitrogen cycle. 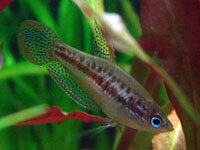 Temperament / Behavior : Mostly peaceful and hardy, they are good fish for beginners. Breeding : Can be difficult. They build bubble nests for their eggs. Aquarium Size : 20 gallon or larger. Tank Mates : Many, given their usually peaceful nature. They may become slightly territorial if placed in a smaller tank with other Dwarfs. Food : Will eat flake, freeze dried and live foods. Vary their diet for optimum health. Gender : Easy to determine. The male is more colorful while females are usually gray. I put one in with 3 balloon mollies and it picks on one of them, did I make the wrong decision about mixing the two? We've not heard of the gouramis being aggressive towards other tropical fish. We have heard of Gold Gouramis being aggressive toward their tank mates. There are many things that could be involved in this situation. Is the tank big enough for all of the inhabitants? If not, it could be that the Gourami is being cramped and causing it to be aggressive. Many tropical fish will become aggressive if not given enough space. There are a few things you can try. The first option is to get another one (if you have enough space). Another one may create a diversion for the one you already have. The second option would be to return the fish to your local pet store if its aggressiveness continues. Will this fish be compatible with frontosa. I have six frontosa that are three inches in length and I'm looking for suitable tank mates for them. The dwarf and the frontosa might be able to do well together now, but not when the frontosas reach their full adult size of up to 14 inches. The dwarf will only reach about 3 inches fully grown and they would probably make a pretty good snack for your frontosas. I have a dwarf gurami which has scales missing on several places on the side of his body. Where the scales are missing it is red. What is it and how do I treat it? Missing scales could be caused by aggressivness from another fish. Missing scales should be able to heal on their own in due time. If you don't have another tropical fish causing the problem then it may be a disease and you will want to treat it appropriately. It is difficult to say what the problem is without more information. I have a 20 gallon tank that is home to 6 neon tetras, one glo-lite tetra, two zebra danios, and one ghost glass catfish. (the last three species are survivors, i'm not getting any more of their species) I also, if possible, am going to get a bristlenose pleco. If i were to get a dwarf, would it be overstocked? Or could I get either gourami or pleco? Or no pleco at all? The "general" rule of thumb is 1 inch of fish per gallon or two of water. But that could all depend on the type of fish we are talking about. Do you think a 20 inch fish would live comfortably in a 20-gallon tank? Me neither. As adults all of your current tropical fish will total about 17 inches of fish. If you add in a Bristlenose (adult size ~ 5 inches) and a dwarf gurami (adult size ~ 3 inches) you will have around 25 inches of tropical fish in your 20 gallon. This would be an overstocked tank, but if you are set on getting more tropical fish just realize that you will need to perform maintenance more often. Considered one of the more aggressive gouramis. Be careful when choosing tank mates. Male Pearl Gouramis may bicker with each other, but overall this is generally a good community fish. A smaller gourami species with very nice colors.